Anyone tried Andro WANOKIWAMI MIDORI DEF blade? Post subject: Anyone tried Andro WANOKIWAMI MIDORI DEF blade? After seeing Koudai Hiraya play, I googled to find any kind of reviews or write ups on how the Andro WANOKIWAMI MIDORI DEF blade plays. But there is very little info! Has anyone here tried it? Can anyone shed some light on it? Stiff/flex? Slow/fast? Hard/soft? Just after a little review on the blade! Post subject: Re: Anyone tried Andro WANOKIWAMI MIDORI DEF blade? WANOKIWAMI - a unique project. Takeshi Wanaka, a Japanese master in wood processing with the focus on processing noble woods and andro® developers worked together hand in hand. Wanaka, a well known greatness in his field with many international awards, brings all his know-how of selection, processing and bonding premium-wood into this project. The andro® development team has deliberately left a free hand to Takeshi Wanaka in many respects to allow influences from another wood processing branch. Promotion players, coaches and test players have confirmed this in numerous tests with one voice. "Wood processing" does sound quite industrial rather than artistic..
Can you compare this blade to any of the more popular ones? Would you say it's stiff and soft? But slow? How slow? How is it in the chopping department? Recently bought this blade (from the person above) and tried for a couple times with my signature rubbers. The blade has a pretty nice feel of classical all-wood blade, not too soft but sure not too hard at any mean. It is much more powerfull and spiny then my Fibercomp but variing throw angle is hard to control in short game. My main strengh is keeping balls low and fast over the net and I cannot play my game with this blade. Also the flared handle is slick and too thin for my taste. But: I thought I am not good at chopping and tried to avoid it but this blade makes me a steady chopper. 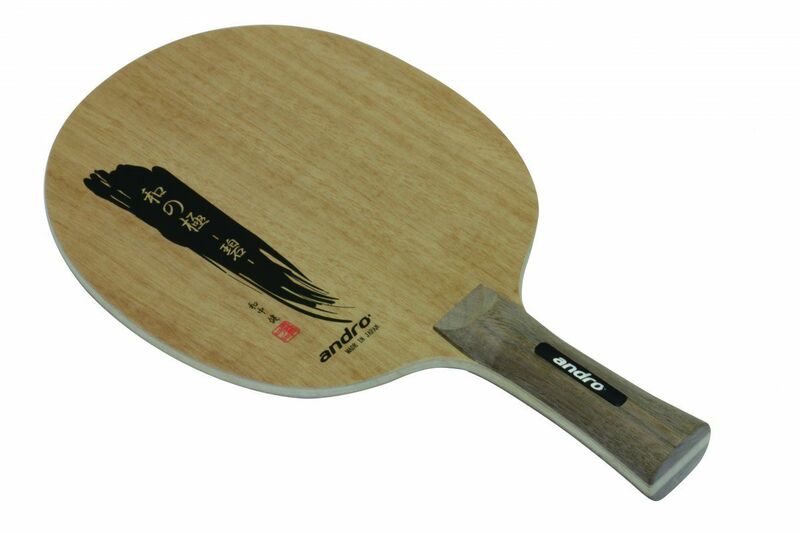 My FH was rather flat but this blade give me a chance to develop all-round spin game. I will play with this blade for a while to improve my experience and technique away from the table. But Fibercomp is still my main sharp tournament weapon. About me: I play close to the table. My main defense stroke is chop block and I often win points directly by BH ox attack of any underspin ball. Speed wise, it is faster than a good many other defensive blades. Faster than defplay, hadrawshield, innershield zlf for instance. It feels quite similar to the original koji matsushita blade. For physical characteristics -- the handle emblem on my particular one is a lengthy black piece of material and it is not flush with the wood. It is raised, rather annoyingly so in fact! When gripping it, my fingertips feel like they're holding onto a tiny bar running across the handle. I've considered taking off the rubbers and using the backhand side for the forehand, since the BH does not any any emblems or indents etc. I've still had to sand down the handle, as the place where it meets the blade has pretty sharply angled curves, so I sanded the handle a bit to smooth out and flatten this part. Otherwise it feels like your thumb is resting on a ledge, instead of flowing into the blade. Playing wise -- very good control, a bit on the stiff side though not overly fast. Nothing really stands out about it for me. It's a good choice for those people wanting a relatively slow defensive blade, yet dislike the flexy/high vibration types. I think it's quite good and fills in the gap nicely between blades like the joo/koji offensive and ones like defplay/hadraw shield. Meaning it is medium fast for a defensive blade. Thank you for the review. Would you consider selling it?